Synopsis (from the publisher): Winter Parva is a “picturesque” (touristy) Cotswold village with gift shops, a medieval market hall, and thatched cottages. After a disappointing Christmas season, the parish council has decided to hold a special event in January, complete with old-fashioned costumes, morris dancing, and a pig roast on the village green. The “pig,” in fact, is Gary Beech, a policeman not exactly beloved by the locals, including Agatha herself. Although Agatha has every intention of leaving matters to the police, everything changes when the Gary's ex-wife, Amy, hires Agatha's detective agency to investigate—and another murder ensues. 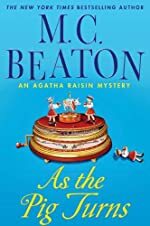 With that provocation, how could any sleuth as vain and competitive (and secretly insecure) as Agatha do anything other than solve the case herself?